Set your ‘02-Current Mini Cooper apart from the rest with this unique Rally Stripe graphics kit. 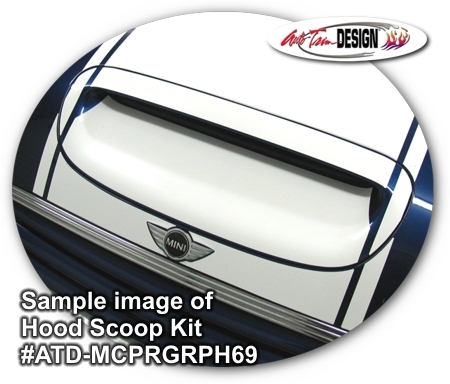 Precut kit is packaged to cover your Mini's Bumper, Hood and Rear Gate areas with a 17.5" (44.45cm) width stripe that features a .75" (19.05mm) pinstripe at each side separated with a .325 (8.255mm) space as shown. Stripe package is not just a 17.5" (44.45cm) strip in a box. Kit consists of prefitted, tapered and contoured pieces as shown. Kits available are specifically made for the ‘02-Current Mini Cooper factory bumper, hood and rear gate areas and will not fit any other vehicle. Optional Roof and Spoiler Kits are available. Trimmable one (1) piece Spoiler Kit (ATD-MCPRGRPH22) includes one (1) 12" x 17.5" (30.48cm x 44.45cm) piece that can be hand trimmed for custom spoiler applications. Cooper and Cooper S kits terminate at each Bumper Top and do not extend down the Bumpers as shown on the John Cooper Works model.